With a contemporary stainless-steel front panel, durable metal frame, and a bright display, the Gaggia Accademia Super-Automatic Espresso Machine embodies refined design aesthetics. 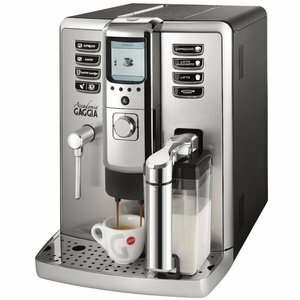 For ease of use, it is anchored by one-touch, programmable push-button controls for espresso, hot water and milk outputs, the Accademia dispenses perfect beverages on demand. Just select your desired beverage from one of seven dedicated buttons capable of delivering the following drinks: espresso, caffe, caffe lungo, cappuccino, latte, latte macchiato and hot water. This intuitive espresso machine comes equipped with an innovative new milk management system. Fully detachable, the Academia’s Cappuccino System features an external milk circuit and a sturdy carafe that can be removed and refrigerated to keep your milk fresh. You can also choose to froth manually, since the machine has an integrated steam wand/water dispenser. With a ceramic burr grinder, automated user friendly controls, as well as dedicated machine and milk circuit cleaning cycles, the Gaggia Accademia is truly a turnkey machine for the busy coffee lover. The Accademia has a removable brew group for hassle-free maintenance. It is also equipped with automated milk circuit cleaning and descaling cycles. This unit uses a Mavea Water Filter to prevent mineral and scale build up. Accademia Gaggia will make you a real barista able to satisfy any desire: from the traditional espresso to a creamy cappuccino... and much more!